Elle Belle Creative: I want to be ReMarthable! Martha is running a contest and asking people to show her how "reMarthable" they are by sharing a craft or recipe or idea that they've done that has that Martha quality to it. I need your help... 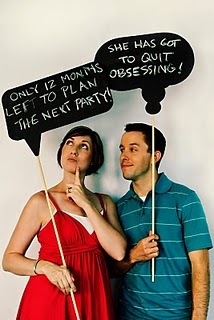 I can't decide between two of my favorite projects - the photo cupcake picks or the chalkboard thought bubbles. Will you please please leave me a comment and tell me which of these two projects you think I should submit to Martha? I think the chalkboard thought bubbles can be used for so many more things! I had never seen anything like them before your original party post! I love the idea! That has my vote! That is a tough decision because they are both really awesome ideas. I love the cupcakes as a customizable birthday surprise, but I think the chalkboard thought bubbles are more versatile. my vote is the chalkboard!good luck! The chalkboard bubbles for sure! I also think you should go with the chalkboard bubbles. 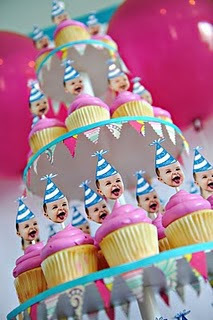 I have been searching everywhere for a party idea for my sons 1st b-day. When I saw this I was hooked. Thanks you much awesome idea!!! I, of course, love both ideas - but if I had to choose 1, it would be the cupcake heads. They are so personal & make the birthday boy or girl the center of attention. My vote is for the baby cupcake picks. Are we just confusing you more? In any case, best of luck with whichever entry you choose! I love the baby cake! You should enter that! I adore both ideas, don't make me choose! Buuuut... I think the speech bubbles. They work for photobooths, regular photoshoots, first day of school (I'm in 3rd grade! ), etc,. Actually, I think I might have to go make some.